Jeff Booth and his team at Secor Road saved me, again! My transmission failed on my car, leaving me stranded on the road. Jeff quickly sent a tow truck out to pick up my car, and get it off the road. Jeff diagnosed the problem and fixed the same day. I was prepared for a transmission replacement, but quick fix, saved me $2K. Jeff noticed my brakes were completely worn, and at risk of total failure, he recommended replacement which I gladly agreed. Jeff even provided a loaner car. Professional, trustworthy, reliable, friendly and fast. Jeff Booth and Earl Brothers have been my auto mechanic for over 20 years. I highly recommend Jeff Booth and Earl Brothers. Earl Brothers was recommended to me by a friend. Initially took my wife’s car in for an oil change which they were able to take care of in a timely manner. While dropping my wife off to get her car the manager, Mr Booth, came out. He had heard my car pulling up and proceeded to check out the engine. He figured out and explained to me what the sound indicated and gave me quick fix advice free of charge! Jeff and his team have the knowledge to get repairs done properly saving time and money. Very knowledgeable and honest. Quoted me a $500 repair over the phone. When they started on the repair they found it was a smaller issue and saved us $300! Will return with ANY future car issues we have. Very professional, polite and straightforward. Accomplished the quoted job, they were not content with the results as another problem was highlighted after 1st repair. Displaying a meticulousness that is rare now, they took care of second issue, all for less than original quote (which was a fair price for just the original work). Jeff, the manager, was absolutely helpful and ethical in every way. He called to report on the price, the parts, and service they will do. Very considerate for your time and money. This will be my favorite place to go for major repairs from now on. Loren & Mary Beth N.
Jeff Booth took excellent care of my wife and I for our recent repair. Not only did they do an excellent job on the repair, but they were fast and reasonably priced. On top of it all, the customer service was second to none! Which is a very big deal to us. We were treated like family and will definitely be going back for all of our automotive needs! They are competent, prompt and highly trustworthy. What more could one ask for? Very pleasant, I’ll be honest I’m a price shopper. I had a few issues on my car that had me worried. The gentleman at the front counter was very courteous and very helpful. He reviewed estimates by other shops, and was more than willing to beat the price from other shops. I got my car back later the same day, and the issues were resolved. Very pleased with the service from Earl Bros. Glad to see there are still shops in the area that I can trust. Thanks!!! There are a few trusted professionals one needs in life. A family doctor is one. A mechanic / auto shop is definitely another. An acquaintance referred me to Jeff Booth and Earl Brothers about eight years ago when my car needed a new transmission. Through three other vehicles, Jeff has never steered me wrong. He’s a very straight-forward, no BS guy and won’t recommend service on my car unless it’s needed. 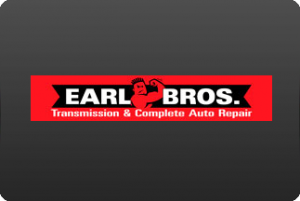 I whole-heartedly recommend and trust Jeff Booth and Earl Bros with my vehicle’s service needs.